﻿ Global Trends affecting Travel Industry. How to overcome them? Traveling is one of the favorite activities that every individual wish to indulge in. The fact of the matter is that everybody loves to travel. The worldwide international tourist arrivals will be crossing 1.8 billion by 2030. We all try to save as much money as possible to sponsor our travel plans. As soon as we are back from a trip, we are already planning for the next one. Rising integration of technology with the travel industry is also responsible for this trend. Many websites and apps allow you to perform every activity for booking a trip. This includes booking tickets, hotels, events, local information and much more. The total value of the travel and tourism industry surpassed the US $ 7.6 trillion in 2016. Travel companies are looking to hire outsourcing teams for online travel portal development. Are you also running a travel business? Are you looking to monetize this rising demand for travel? Then you also need to avail travel portal development services for your business. But with the ever-changing trends in the travel industry, you also need to stay updated. Otherwise, you might lose out to the competition. Here is every information you need about global trends affecting the travel industry. The travel industry is one of the most dynamic industries out there. There is so much happening that every year we see some new trends emerging. Many of these trends offer fantastic opportunities for businesses. But they also present particular challenges that need to be overcome. The travel industry is dependent on social, economic and political changes. Many of these factors are beyond the control of travel companies. But by being aware of these changes, travel companies can be more proactive. It will help them plan adaptive strategies. 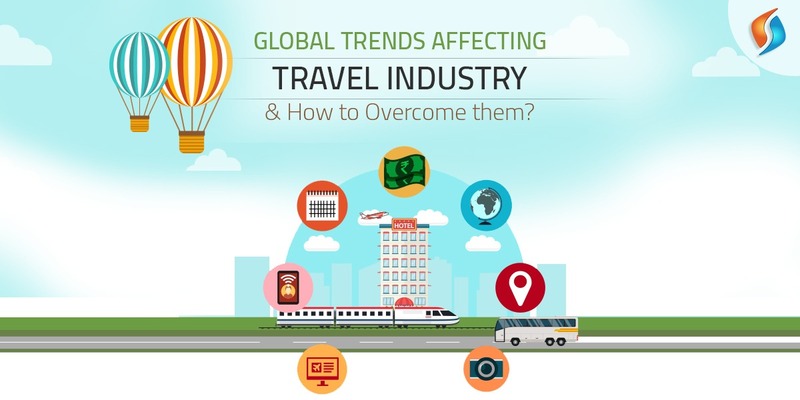 Following are the significant trends affecting the travel industry and how to overcome them. More and more travelers are looking to travel. The opportunities are ripe for travel companies. They must provide unique and rare experiences to the travelers. It is essential for travel companies to offer the customers customized products. These products must allow customers to have unique experiences because every customer wants something unique and creative on holiday. This opportunity leads to a challenge for local travel companies in another country. They must know how to connect with an international guest. The feelings, aptitude, sensitivities of the traveler must be kept in mind. Tourists must feel welcome and at ease while they are enjoying their holiday. Overcoming this challenge with the development of the multilingual travel portals is possible. Companies can also provide multilingual information websites and access to translation services. You can avail the services of a renowned custom web development company in India for help. But due to the lack of suitable personnel, travel companies have not been able to leverage blockchain. Travel companies must opt to hire blockchain developer in India. There are several companies with blockchain experts to cater to this demand in the travel industry. There is a ton of data that every travel company can access on the internet. There is also the data that the company has collected over the years. This data is used to drive various insights. All the future decisions and policies are based on these data analytics. It is essential for travel companies to invest to make their data analysis efficient. This is possible with the help of big data analytics companies. AI can help the companies make data analytics more efficient and accurate. Moreover, AI can help with other crucial tasks such as revenue management, customer service, fraud detection, etc. Many times, travel plans are made at the last minute. As per a survey by Trekksoft in 2018, more than 39% of the travelers made last minute bookings. This is especially true for local activities and tours. Customers make these bookings before arrival or often a few minutes after arrival. This offers a new challenge for travel companies as it becomes difficult for companies to plan the resources. This can only be managed with the help of a secure local network and a robust marketing strategy. Having a portal that offers real-time bookings and prices is the ideal solution, the travel portals are changing the face of the travel industry for good. Companies can opt for experts that offer travel portal development in India. These experts can help create a well-rounded portal for these requirements. Customers are now not willing to wait for anything, as they want every information. They spend hours online looking for travel information as well as making inquiries. This presents an opportunity for travel companies to engage the customer. The companies can aim to push the customer down the sales pipeline. But it is not possible to have a representative always ready. This is where the services of a reputed chatbot development company come handy for you. These AI-based programs can work as the voice of the company, because Chatbots can interact with customers, offer information, make suggestions and engage the customers. Companies will be able to enjoy a better conversion ratio with chatbots. There is an opportunity in every adversity, and the same holds true for the travel industry. Because every new challenge presents a new chance. So if you are also looking to make the most of these trends, then we are here for you. At Signity Solutions, we are amongst the leading travel portal development services providers in India. Our team of expert developers and coders have many years of experience in this industry. We offer the best IT outsourcing services for the travel industry and that too in quick time. Thus, get in touch with us now and let us help you with your travel portal requirements. Contact us now.